26 January is the day that Australians celebrate their nation! The date chosen many years ago as our day of national celebration was the date that the First Fleet arrived in Australia and we think its a great opportunity to celebrate the arrival of many of Australia's most loved animals. Of course there where already many many native animals in Australia, and the Aboriginal people had brought the ancestors to the dingo with them to the continent tens of thousands of years before, but the First Fleeters brought many animals to Australia that we now love so much. Here is a list of the animals on the first fleet when it arrived in Australia. What this list tells us is that Aussies have been loving their pets for a very very long time and that it doesn't matter if you have two legs or four, wings or hooves or what the colour of your fur or feathers are, Australia is a great place to be! 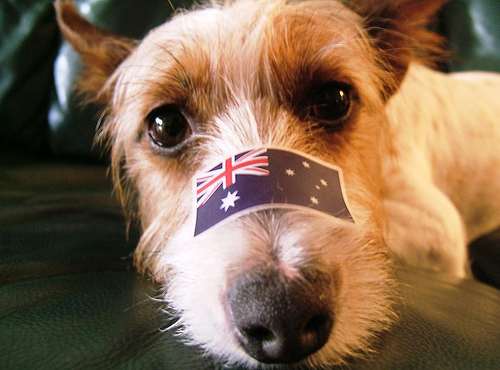 Happy Australia Day to you and your pets!